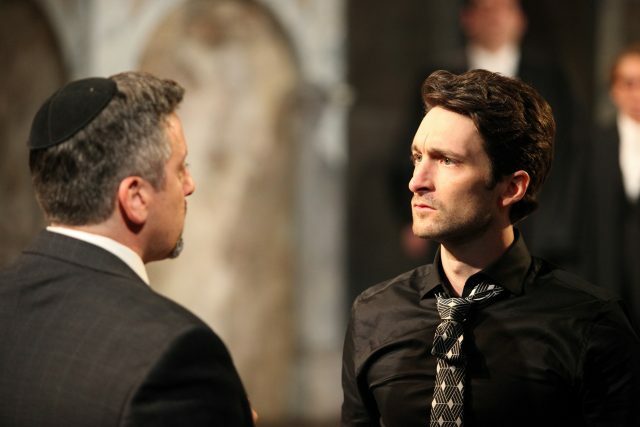 Set in modern day Venice, this stylish, sophisticated production is infused with thoughtful interpretations of Shakespeare’s classic play about a Jewish moneylender, Shylock (Warren Kimmel), and a love struck young man. From the opening choreographed sequence to the climactic courtroom scene, the cast kept us invested in Bassanio’s quest to win Portia’s love and Shylock’s determination to exact revenge through his loan. This cast is brimming with chemistry. Antiono (Edward Foy) and Bassanio (Charlie Gallant) are cheerful dudes who tease each other and do Donald Trump impressions. Portia (Olivia Hutt) and Nerissa (Luisa Jojic) are the best of friends as they brilliantly insult Portia’s suitors. The only performance that came across as a bit unauthentic was Shylock’s daughter, Jessica (Carmela Sison), and her lover Lorenzo (Chirag Naik). Jessica steals her father’s money and jewels to run away and elope with Lorenzo, but their relationship felt a bit forced. The courtroom scene is a stark contrast of mercy versus malice as Shylock is determined to have his bond upheld and be paid his pound of flesh from Antonio. Bassanio is distraught as the predicament his friend is in. It turns out that even the law can be bent to satisfy the will of the majority as Shylock is insulted and cornered through technicalities and coercion. We feel sorry for him, yet we are conscious of his malicious intent against Bassanio. The audience held our breaths as Bassanio spits on Shylock with contempt. This production doesn’t hold back or sugar coat any of the content, instead it takes this timely story and adds relevance, giving it new meaning for a contemporary audience.